The Chelsea manager, Carlo Ancelotti, has confirmed that Ukrainian striker Andriy Shevchenko has chosen to leave the club. Ancelotti said that Shevchenko’s decision was based on a desire to play first-team football – something he could not be guaranteed at Stamford Bridge. 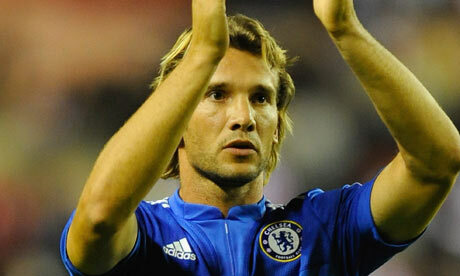 Shevchenko spent last season on loan with Ancelotti at Milan but returned to Chelsea this summer. He made an appearance as a substitute against Sunderland in the 3–1 win at the Stadium of Light, and Ancelotti had hoped the Ukrainian would play a part in Chelsea’s season. However, the 32-year-old has now decided it would be better to try and find first-team football elsewhere, despite having a year left on his contract. It is understood Shevchenko will return to Dynamo Kiev, the club where he made his name in the late 90s, although Chelsea are unlikely to receive a fee. Such is the amicable nature of his parting that Chelsea may even absorb some of Kiev’s costs by part-funding his £120,000-a-week wages. The Italian also rejected speculation that Chelsea had submitted a £57m bid for the Bayern Munich midfielder, Franck Ríbery. “No that is not true,” said Ancelotti. another favourite player of mine. but this one does not shine as others. i loved his predatorial finishes during his stay in dynamo kiev. then he moved to ac milan in which i still followed. then he came to chelsea. there was too much pressure on him i guess. it went down badly for him there. i still believe that sheva is still dangerous. its just that he needs more games. err is it possible if he can be transferred to manchester united for free. i think he’s better than berba. anyway good luck sheva! article from Guardian. just to update on my previous post as promised..after some deep thought and some read-ups, i finally made up my mind to put out the two arsenal player – fabregas and bendtner. they’re replaced by jarvis and drogba. so here’s my line up for gameweek 4 in Stadium Astro Fantasy. Samuel Eto’o and Zlatan Ibrahimovic will be back at their old clubs as Inter and Barcelona were drawn together in the Champions League, along with Dynamo Kiev and Rubin Kazan. The other big draw is Real Madrid, some people’s favourites for the title, against AC Milan – where Kaka will return – and fellow big spenders Marseille, who could cause an upset in Group C. Manchester Utd face tough trips to CSKA Moscow, Besiktas and Wolfsburg in the English clubs’ hardest draw, with Liverpool also given a tough test in Lyon, Fiorentina and Hungarian side Debreceni. Chelsea will be happy with their draw as it’s Jose Mourinho’s old club FC Porto, Atletico Madrid and Cypriot side APOEL; while Arsenal are also sitting pretty as they face Dutch champions AZ Alkmaar, Olympiakos and Belgian side Standard Liege. the draw had been made. toughest seems like from Group B. Champions from different countries. Group A, Bayern and Juve looks too strong for the other two. Bordeaux might gave some threat there. Group B, in no doubt is toughest of all. Man United known for their strenght, CSKA had been in this competition for years and they do have a strong team backed by Russian internationals. Besiktas have Turkish internationals in their team and been known to gave tough matches to their opponent. Wolfsburg surprises everyone by winning the German League last season. i bet they have some firepower in their team. Group C is quite a challenging group apart from Group B. AC Milan and Real the favourites. Marseille might steal a spot if any of the two slips. Zurich might just be the victim in this group. Group D put up Chelsea as clear favourite. but Porto and Atletico won’t give an easy game against them. The easiest might be against APOEL. Group E lines up Liverpool as favourite. Lyon, despite losing Benzema, is still strong to be written off. Fiorentina can just surprise anyone. sometimes they’re good, sometimes not. Debreceni? i don’t know. Group F is somewhat like Group C with two favourites, one strong team that is ready to take opportunity and one victim-to-be. Barceloan and Inter the top two. Kiev the opportunity-taker. Rubin Kazan the bottom one. Group G looks balanced here. Sevilla, Rangers and Stuttgart most probably have the same strenght. Unirea might be too small for the other three. and the last group, Group H, where Arsenal heads as clear favourite. AZ, Olympiakos and Standard will fight to move to next stage. anyhow this is just my opinion. by February 2010, we’ll see what happens and which team progress to the next stage. source from Soccernet. the new season 2009/2010 Barclay’s Premier League is already in progress. this weekend will be Gameweek 4. lots of drama so far. we’ve seen manchester united stumble against newly promoted burnley, and saw them came back destroying wigan in just 45 minutes. we’ve seen how rafa pointed to his senior players when liverpool loss against villa. chelsea had a nervy start, winning with late goals. and arsenal showed superb performance despite losing adebayor to man city and some players to injury. these in a way, reflects fantasy football. individuals from all around the world line-up their stars to get as much point as possible each week. there’s hundreds of fantasy football hosts on the net. i’ve played at fantasy premierleague, yahoo fantasy football, espn fantasy football and most recently Stadium Astro Fantasy. to be honest, i never really concentrate on playing it. its just for fun. after all, winning it is almost impossible. but when astro came up with their own fantasy football, i thought this could be an opportunity for me to achieve something. hosted locally, that means the prize is more realistic. unlike fantasy football from other places, i won’t even know if i can even get the prize if i win. so this time, with astro as host, i decided to play this with an extra attention. although winning is far from sight, but the fun is there. 4 weeks into the season.. for some, their line-up was awesome. gathering as much as 185 points in total. while im slowly with mid-level teams with only 139 points so far. i played in Malaysia League. mostly Lowyat forumer. after 4 weeks, i learned that initial selection of players really matters to get the most points early season. i didn’t realize earlier that there’s a rule limiting transfers per week to only 2. that makes life a lot tougher after the first game and onwards. some didn’t perform despite the big name and some small team played awesomely good. arsenal surprises me the most as they doesn’t seem to be affected at all when adebayor left. budget limitation of 100m is a norm in many fantasy leagues, so that’s not a problem for me. but having only 12 players is quite difficult. u lose points when more than 2 players in ur team didn’t play. if only one, the reserve player might do some good. and 2 transfers per week? damn hard..
my team: masizi. as many would have line-up their team, mine consists of the big four clubs. but for last week, i chose to omit chelsea players from my selection. although i wanted to have at least one of them but with 2 transfers per week plus budget limitation, that is not possible. so for the coming week’s line-up, i’ll get a chelsea player. after all they played burnley. not to undersestimate burnley whom have beaten the likes of man united, but against chelsea – is just too big for them i guess unless chelsea had an off day like man utd does. this week i planned to feature hart-evra,bridge,figueroa-nani,gerrard,jimenez,kuyt-drogba,keane,bent. no arsenal player? not against man utd. haha.. but im having some difficulties here. i haven’t finalized the line-up yet. maybe tomorrow. i can only transfer 2 players. but i have few players that needs to go out. hart in goal is doubtful as they’re playing chelsea. pretty sure they’ll concede at least a goal there. max points from hart could be 2 points only. ilunga is injured and not playing yet. fabregas is injured and its yet to be confirmed whether he will play or not against man united. bendtner haven’t played competitively for arsenal so far. coming on as subs didn’t provide enough points to the team. 4 players i wanted to put out. on top of that, drogba’s recent form shows that he might score in these next game. i’d like to have him but he’s a bit pricey. with this in mind, i need to put out a combination of 2 players that would be sufficient to accomodate drogba’s signing plus another player that’s worth a smaller value. will update on this tomorrow.